Karen Anderson finds herself continually challenged and fascinated by watercolor. The landscapes of Minnesota’s North Shore are her inspiration. “My paintings are an attempt to understand God by trying to capture the beauty in nature,” she says. Karen has also quilted and enjoyed landscape design. She finds it interesting to see how concepts of design apply across mediums. Karen’s appreciation of art has spanned her lifetime: “My parents and grandparents had a couple of cherished pieces of original art in their homes. My mother and grandmother dabbled in painting themselves. Without using words, they taught me to value art,” she says. Later in life, Karen’s painting added balance to her life as a full-time mother to four children. Karen shares her love of art and gives back to the community in unique ways: She has taught in an arts camp at Covenant Park Bible Camp. She expresses gratitude for the opportunity to lead a painting class for people with Alzheimer’s in recent years. 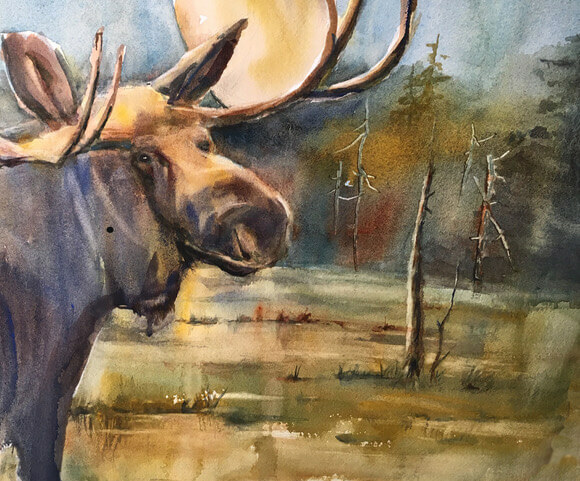 Karen participates in local art shows affiliated with several art organizations, including the Lake Superior Watercolor Society and the Artists of Minnesota. The Environmental Protection Agency and St. Louis County have some of her pieces in their permanent collection. Karen has won awards at the Artist of Minnesota shows, including the Member’s Choice Award. Her work has been selected for exhibit at the Landscape Arboretum in Chanhassen, MN and at an art show in Ohara, Japan. Born and raised in Minnesota, Karen moved with her husband and family to Duluth from the Twin Cities in 1998. In her spare time, Karen enjoys spending time with her family, hiking with her dog, skiing, gardening, kayaking, and enjoying time at her cabin. Time spent outdoors provides Karen with opportunities to observe and plan her next painting. 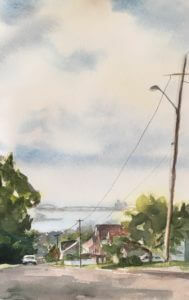 Karen’s artwork may be found on the Lake Superior Watercolor Society’s website: http://lakesuperiorwatercolor.com/user/kanderson. Click here to visit our Art 4 Shelter home page.